1982, Starring Robin Ward, Gina Massey, Laura Robinson, Diana Reis. Directed by Anthony Kramreither. 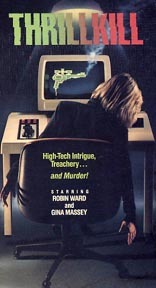 Robin Ward is the sole standout in this rarely seen Canadian crime thriller about double crosses in the world of computer fraud, circa 1984. Best known as a "meteorologist" for Toronto's CTV affiliate in the 80s, Tony Lo Bianco-lookalike Ward has appeared in a handful of other Canadian B-films including Mark of Cain, the Julian Roffman-produced Explosion and even Dr Frankenstein on Campus. Surprisingly his acting is both convincing and natural in Thrillkill, but he is unable even to begin to offset the wretched performances by the other actors that fill up the screen. No stranger to Canadian schlock herself, Diana Reis stars as Carly Kendall, a computer game programmer working on a new game called Thrillkill (" The Game that Plays You!"). In her spare time she enjoys flavoured teas, walks on the beach, and embezzling three and a half million dollars from corporate bank accounts with a new high-tech "modem" the size of a shoebox. Draining her bank account of the money she electronically transferred there, Carly tells her sleazy boss Capsar that she is going on vacation. The, using her home computer, which is roughly the size of a refrigerator, Carly encodes the current whereabouts of the money into Thrillkill. To ensure that everything goes off without a hitch, she decides to go for dinner at The Keg, because everybody knows that's where all the millionaires eat. But when she sees Caspar's crony Grisson watching her from the bar, she slips into a phone booth and makes a frantic call home to her sister Bobbi. She tells Bobbi to meet her immediately for a nice juicy steak, possibly a baked potato, her choice of side dish and a secret so important that it can't be revealed over the phone. Bobbi agrees to meet her, but just as she is about to leave, a plainclothes detective named Frank Gillette (Ward) rudely walks in the house and starts asking questions about her sister's whereabouts. Unsure of what it's all about, Bobbi refuses to tell him anything and Gillette decides to ask her out on a date, instead. Back at The Keg, Grisson has thoroughly unnerved Carly, so she grabs a cab before Bobbi arrives. She goes off to meet her embezzling partner, Adrian, a woman who vamps about her apartment with a veil. When Carly goes upstairs to one of the bedrooms to pack, a computer voice informs her that she has entered a video game of some sort and if she doesn't find her opponent, she will die. Seconds later, an unseen person strangles her to death. Caspar and Grissom show up at the apartment to demand the whereabouts of the money, but it is too late. With Adrian's help, they dispose of the body and we are finally let in on what is going on. Carly was planning to skip town with the cash forever. Adrian, Caspar, Grissom and Toni (another woman not present), were all partners in this embezzling scheme, and when they discovered that the account was empty, they began getting very suspicious. When Carly told Caspar she was leaving, he figured that she was trying to double-cross them. When Bobbi can't find her sister at The Keg, she goes back home. Detective Gillette calls on her again and tells her that her sister is missing. She agrees to meet him at "The Vegas Club" to tell him everything she knows, which is actually nothing. When she gets there, she finds it is an upscale bar lined with arcade machines. Like any sensible person she starts playing a little Galaga until she spots Grissom and Caspar staring at her. Bobbi steps out in the parking lot, and just as Grissom is about to grab her, Gillette shows up and saves the day. To celebrate, he offers her his Teenie Weenie. That's the name of the house specialty at the upscale hot dog restaurant(!) they spend their first romantic date at. Frank tells Bobbi about the embezzling, and pumps her for any information about where the money might be. Bobbi can't really remember anything that might help, but she is beginning to fall in love with her hot-dog connoisseur saviour. This possibly isn't the best idea though, because we soon see Frank drive away with Grissom. Frank (whose real name is Cory) is just playing the part of the undercover detective to get the money from her sister! Compounding the problems faced by the evil partners, Caspar is killed, run over by the same mysterious pair of hands that murdered Carly. Toni and Grissom think that Adrian already knows the location of the money, and that she is planning to double-cross the other partners. When confronted, Adrian tells them that the real person they have to look out for is Frank/Cory because Bobbi will most likely tell him first. To nip this in the bud, Toni and Grissom break into Bobbi's house and torture her with an electric knife, but Bobby doesn't know where it is. The next night, Frank tells her that the location might be locked inside Thrillkill, so they stay up all night playing the game. Hilariously, Thrillkill isn't a computer game it's actually a videotape of a long hallway. A woman in a space age outfit and a gun appears at one end, and the player has to shoot her. It's all extremely slow and laughable, but it's also probably the original first-person shooter! Bobbi finally cracks Thrillkill and discovers that the money is in a locker at the convention centre. She calls Frank, and leaves a message that she has cracked the code before she takes off to get the money. But Bobbi isn't the only one one by one all the mistrustful partners find out and rendevous at the centre. During a shoot-out between Grissom and Adrian, Grissom tells Bobbi that Frank isn't who he says he is. Then the real Frank Gillette shows up and offers to save her from the wrath of the partners. But Cory enters the picture and tells her that Frank's not Frank either, it's another partner in on the scam. Who can she believe? Who can she trust? The basic premise behind Thrillkill of deceitful and greedy thieves trying to outfox each other is a good one, but this film just gets tangled in it's own plot complexities. Even when we discover why Carly even needed partners since she is doing all the embezzling work herself, it isn't very plausible. Handled better, Thrillkill could've come off like a serious version of It's a Mad, Mad, Mad, Mad World. Instead, it's mired in the same kind of depressing cliches that sink other, similar mid-1980s Canadian crime films like The Dark Side. But at least that film had some interesting locations, whereas Thrillkill looks like it was mostly shot in the director's home. Ironically, a game called Thrillkill was later produced for the Sony Playstation, but was never released. EA Games decided that the Mortal Kombat-style fighting game with weapons it developed was probably too violent for the time and shelved it. We weren't so lucky with the film.